A single, recessed slab of stone on the exterior west wall of Parliament Hill’s Centre Block is the First World War equivalent of a ghost bicycle — an entirely unofficial and impromptu memorial winked at by the powers that be. And not just for six months, but for almost a century. Carved into the stone is this simple message: “Vimy Ridge, 1917-04-09.” No one is entirely sure how it got there. Some suggest the inscription is grief set in stone, incised by a mason who had just learned of his son’s death at Vimy. Others believe it expresses a stone carver’s elation over the hard-won victory of the Canadian Forces working together as a unit for the first time. Almost everyone agrees it was some kind of heartfelt graffiti. The inscription was brought to the attention of the Centre Block’s demanding architect, John Pearson, shortly after the battle it commemorates, about seven months after the cornerstone of the building had been laid. Pearson chose not to remove it. Today, it remains a largely overlooked expression of the same commemorative feeling inspired by the imposing National War Memorial just a few hundred metres to the east. Canadians have gathered at the War Memorial for every Remembrance Day since it was dedicated in 1939. But Ottawa abounds in echoes of wartime sacrifice that don’t get the same attention. 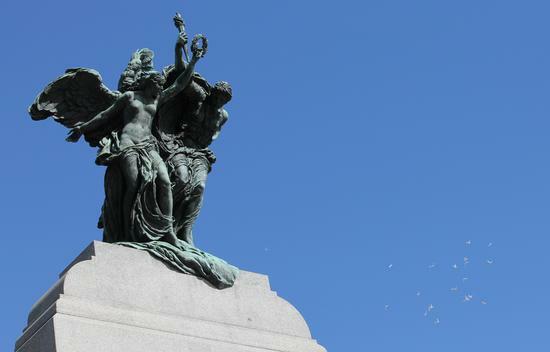 The figures at the top of the War Memorial symbolize peace and freedom. Photo: Veterans Affairs Canada. Some are small, like the 10 poppy-bedecked street signs that have sprung up since 2005 in new subdivisions from Kanata to Orleans, each honouring a local veteran. Some are grand, like the Centre Block itself. Rebuilt after a 1916 fire, the building was dedicated to “the valour of those Canadians who in the Great War fought for the liberties of Canada, of the Empire, and of humanity.” That makes the Centre Block, in effect, Canada’s first national war memorial. Two other Ottawa buildings, begun shortly after the Second Word War, are also dedicated war memorials. The East and West Memorial Buildings on Wellington Street, joined by the Memorial Arch that spans Lyon Street, were originally called the Veterans Memorial Building and housed the Department of Veterans Affairs. They now serve other practical purposes, but retain their commemorative status. Almost as old is The Ottawa Memorial, a stylized iron globe surmounted by an eagle that has graced the heights above the Ottawa River near Rideau Falls since 1959. Though a familiar sight along Sussex Drive, few recognize it as a memorial to 800 men and women who lost their lives while serving or training with Air Forces of the Commonwealth in Canada, the U.S. and the West Indies during the Second World War. Nearby is one of Ottawa’s newest memorials, a statue of Lt.-Col. John McCrae, the surgeon-poet who authored In Flanders Fields. Unveiled in the spring, the bronze portrait sits on the site of an earlier memorial to members of the Canadian artillery, fitting because McCrae had commanded an artillery battery as well as serving in battlefront operating rooms. 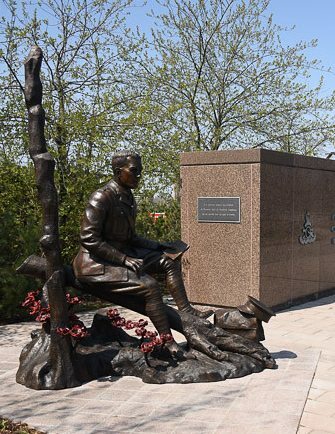 This statue of John McCrae was unveiled on May 3, 2015 to commemorate the 100th anniversary of the writing of In Flanders Fields. Photo: Veterans Affairs Canada. Adjacent to it is an unofficial war memorial, the Mackenzie-Papineau Battalion Memorial, which honours the more than 1,500 Canadian volunteers who fought on the Republican side against fascism during the Spanish Civil War, 1936-39. It was erected in 2001. If war memorialization was a new, and relatively rare, occurrence in the 20th century, the same cannot be said of the years since. 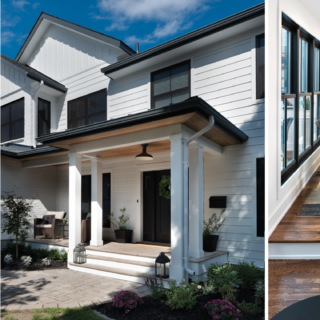 This past summer saw the dedication of the graceful Vimy Memorial Bridge over the Rideau River at Barrhaven, the latest in a profusion of local memorials since the 1990s. 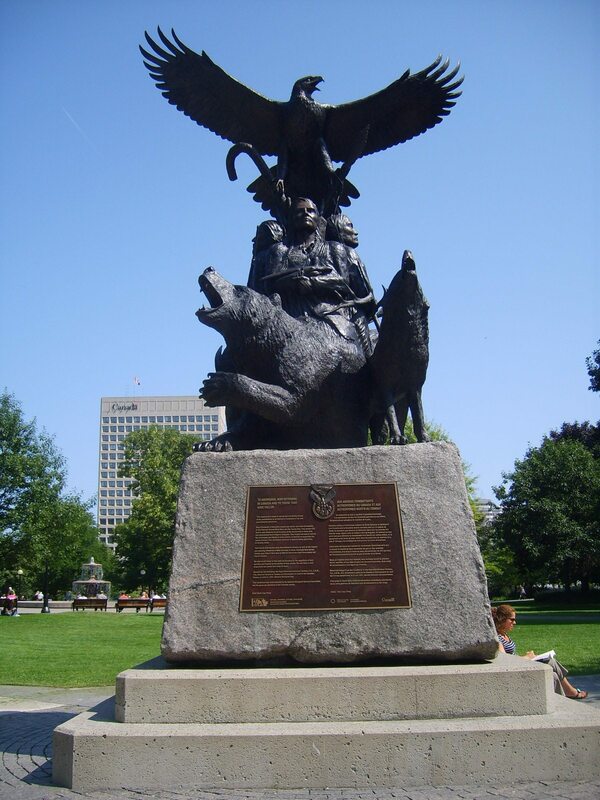 The National Aboriginal Veterans Monument was unveiled in 2001. The Animals in War Memorial was dedicated in 2012. Both are in Confederation Park, not far from the South African War (Boer War) Memorial which was funded by a children’s penny-drive in 1902. The National Aboriginal Veterans Monument is found in Confederation Park. Photo: Veterans Affairs Canada. The Defence of Hong Kong Monument, honouring Canadians who fought and fell in Hong Kong during the Second World War, was dedicated in 2009 at the corner of King Edward and Sussex. The Valiants Memorial, above the underpass at Confederation Square, is a series of bronze busts often draped in woolen mufflers in the winters since 2006. It commemorates a series of key figures in Canada’s military history. Canadians who died in the Korean War are honoured with the Monument to the Canadian Fallen at a site near the west end of the Mackenzie King Bridge since 2003. Its twin is in Korea. The Royal Canadian Navy Monument, erected in 2012, is a sail-like marble structure near the river at Richmond Landing. It will soon be joined by memorials to Canadian winners of the Victoria Cross and veterans of the war in Afghanistan. And we haven’t even mentioned cenotaphs in places like Kars, Stittsville, Manotick, Kanata, and Orléans, memorial plaques in every church old enough to have sent members of their congregation overseas during worldwide conflicts, and the Peacekeeping Monument erected near the National Gallery on Sussex in 1992. The point is this: there is little excuse not to remember the sacrifices of veterans on Remembrance Day. Their reminders are all around us.